An aggregate is a collection of items that are gathered together to form a total quantity (Wikipedia). The Aggregator module ccan gather the content of several pages and/or sections to form one new page. A configurable description text, example: "This module aggregates selected nodes". A configurable header text, example: "Aggregator demonstration". A configurable introduction text: . "This page demonstrates aggregation of of pages [...] displayed as a small slideshow". A row of pictures that moves from right to left. Clicking on one of the pictures stops the movevent. Cliking again restarts the movement. Below the row is a clickable link 'See more...'. This link leads to the Slideshow page. A header text 'News 2014-11', a paragraph of text and a clickable link 'Read more...'. This link leads to the page. The description and introduction texts are paret the Aggregator module. 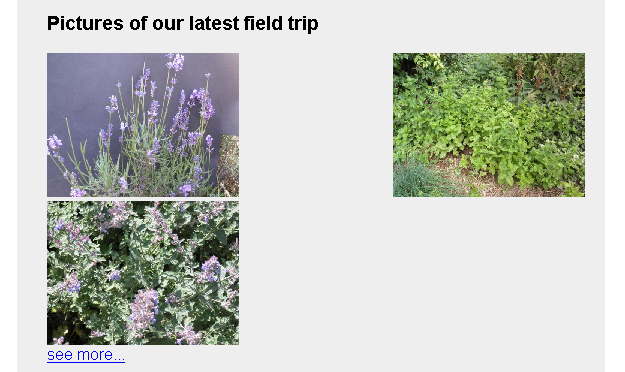 A page created with the Snapshots module, containing the pictures. A News page, created as HTML page. When discussing the configuration options and the tips, we will refer to these pages. Example: if you have a News section with pages that are displayed in the Aggregator, you can move those pages to another place. Set the page the page as expired. Set an embargo on the page. Here you can configure the aggregator module. You can add an optional header and an optional introduction to the aggregator. You should specify a comma-delimited list of page or section numbers. 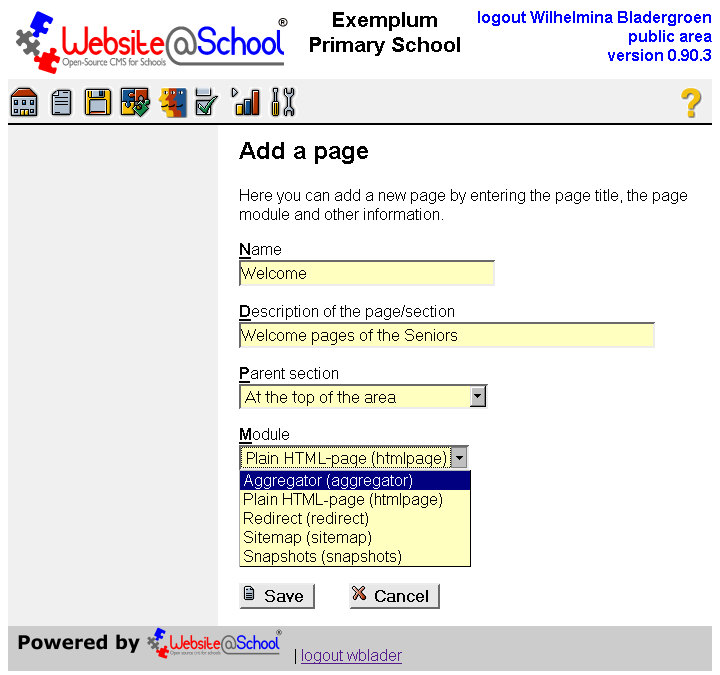 The specified pages will be aggregated in the output of this module. If you specify a section number, all individual pages within that section are aggregated, in natural order or in reversed order. If a specified page is linked to the snapshots module, the specified number of images is displayed and rotated after the pause specified below. If the page is linked to the htmlpage-module, the first few paragraphs will be displayed. Pages linked to an unrecognised module are not aggregated. Header: The header text. HTML markup can be used. Introduction: A longer text can be entered here. HTML markup can be used. Pages created with the FCKEditor, the CKEditor or the Plain HTML editor. The description of the page is used as header. The name of the page is not used. Pages created with the Snapshot module. A section containing pages that match criteria 1 and 2. These pages are displaying in a certain order (see 'Reverse sort order' below). All other pages are silently omitted. HTML and Snapshot pages can be aggregated more than once on an Aggregator page. Number of pages to aggregate: To prevent the Aggregator endlessly adding pages, a maximum number of pages can be set. This maximum number applies to the total number of separate pagess and the pages in section(s). [ ]Reverse the sort order: The sort order of pages in a section can start from the first page down to the last, or the reversed order, i.e. the last page in the row is the first one to be displayed. 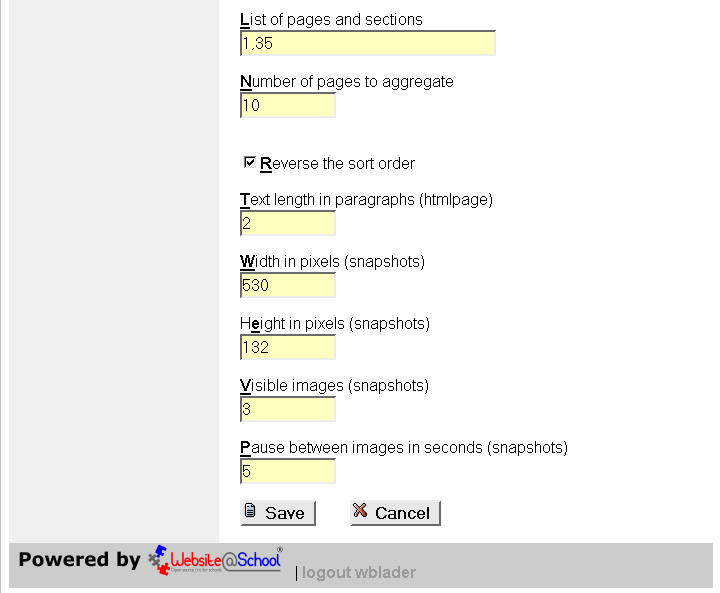 Text length in paragraphs (html page): This field refers to the lay-out of HTML pages in the Agrregator module. The length is set in paragraphs because the <p> tag is used to cut the display of the remainder of the page. This tag is used in all HTML editors. The CK and FCK Editor both automaticcaly insert a <p> tag in the top of the page. This tag is not counted. When using the Plain HTML editor, you have to start your text with a <p> tag. Width in pixels (snapshots): For the pictures aggregated from the Snapshots module, a certain space is reserved. With the width, the total width for one or more pictures is set. Height in pixels (snapshots): Available height for pictures. Visible images (snapshots): Defines how may pictures are displayed in the row of pictures. Pause between images in seconds (snapshots): The (row of) pictures rotate endlessly, moving from right to left. Example: if we have 6 picutrues, the display order is: 123, 234, 345, 456, 561, 612, 123, et cetera. Save: To save your work and return to the Page Manager. Cancel: To cancel your work and return to the Page Manager. If no text is entered in these fields, nothing is displayed and no space is taken from the page. Of course it's also possible to create a header with a page node. Then the page descriptoion is the 'header' and the paragraph(s) can serve as the introduction. However, where does the 'Read more' link at the bottom lead to? suppose you want an Aggregator page with 4 sections, each containing 3 pages. Set the number of pages to 12. To keep each section with only 3 pages, creacte an archive folders in the 4 sections. Move the page you want to get rid of to its archive and add a new page at the top or the bottom, depending on the sort order (see below). This great feature is specially designed for HTML pages and Snapshots modules in a section. We will demonstrate the feature with an example. -Reverse not checked: When adding a page at the top of the section, the page at the bottom is no longer displayed (maximum number of exeeded), so the most actual news is always first. - Reverse checked: when adding a page at the bottom, the first page is no longer displayed. Working in this way may simplify maintenance of the aggregated pages. 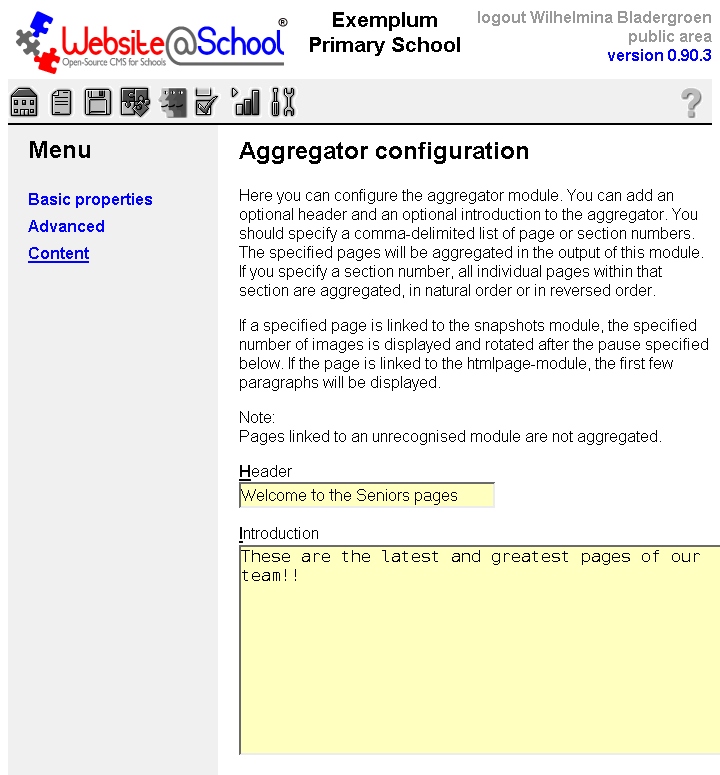 A welcome page with the Aggregator module. It's not a bad idea to make this page readonly, so it cannot be deleted accidentally. In the example screenshot below it's node 50. In the invisible section a page with their introduction text: node 52. Also in the invisible section a Snapshot page with rotating portraits of the 17 pupils: node 53. A visible section Archives: node 54. Pages with old news: noedes 55 ,56 ,57. Page with news on week 9, node 58. Page with news on week 10: node 59. Page with news on week 11: node 60. Page with news on week 12: nodie 61. In this way the Introduction and the pictures of the pupils can be permanently displayed. The news that appears every week can be easily changed. Week 12 and 11 are displayed, because the reverse sort order was checked. Only four pages are displayed, so week 10 and 9 are not displayed anymore. 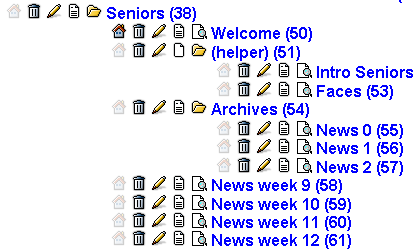 When a new page is added (week 13), it is added to the bottom of the Seniors section. Then week 13 and 12 are displayed. And so on and so forth. If necessary, the archive can be used to move old stuff to which is still accessible on the site. The invisible section is indeed not visible on the site. How to set these values? They depend on a number of factors. First there is the space available for content in the chosen fheme. Second, there is the screen size on which the site is displayed. For example, on a screen with a size of 1024x768 (widthxheight) pixels, the Frugal theme has a content area width of 580 pixels. On a 1280x1024 pixels screen, the content area is about 860 pixels wide. On the same screen widths as above, using the Rosalina theme wich uses the full width of the screen, you have a content width of either 1024 or 1280 pixels. Notice that the aspect ratio (the relation fo the width to the height) of the screens is 4:3. Most picutres have the same aspect ratio if taken in landscape format. Now let's do some calulations. We assume we use the Frugal theme on a 1024x768 screen. With a screen ruleer  we measure the content width. It's 580 pixels. We want 3 pictures in a row. So: 580:3=193 pixels. That is the width per picture. Now, with the aspect ratio of 4:3, we can calculate the heigth by calculating: 193:4=48x3=144. That must be the heigt of the snapshot. In the row of the first screenshot, the last picture is in portrait format, so not all available space was taken and the row could be displayed. In the next screenshot there was too little space so the third picture was moved to the 'next'row. Left and right from the content 20+30 pixels of space are used. We have to substract them from our 580 pixels. 530 pixels remain for the pictures. So we can redo the calculation. Let's take another route to the result: 530:12=21x3=132. Now it's ok. Notice that pictures taken as portait format are equally reduced in size, so are shown much smaller. If you want borders around the pictures, they will also take space form the width available for the picutres. So it's better to reduce the total width a bit more, say 512 pixels. Screen ruler: there are a number of screen rulers on the Internet for both Linux and Windows. In Windows we like the one packed with MWSnap by Mirek Wojtowicz http://www.mirekw.com/winfreeware/mwsnap.html (in our humble opinion the best in Windows) and in Linux we use Screen Ruler by Ian McIntosh. More rulers on http://alternativeto.net/software/gnome-screen-ruler/. - in principe is alles in deze pagina te stylen via BSSS. 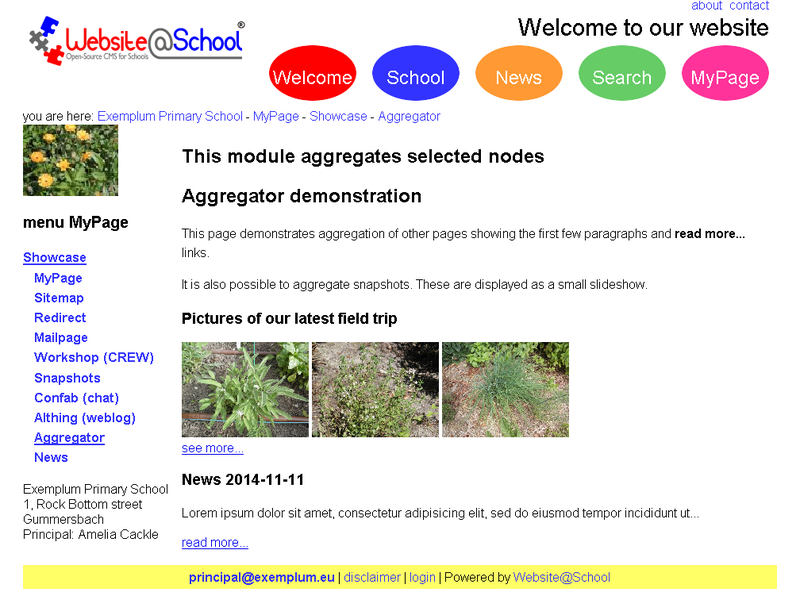 The aggregator module in Website@School.